Columbine tragedy | live. laugh. love. 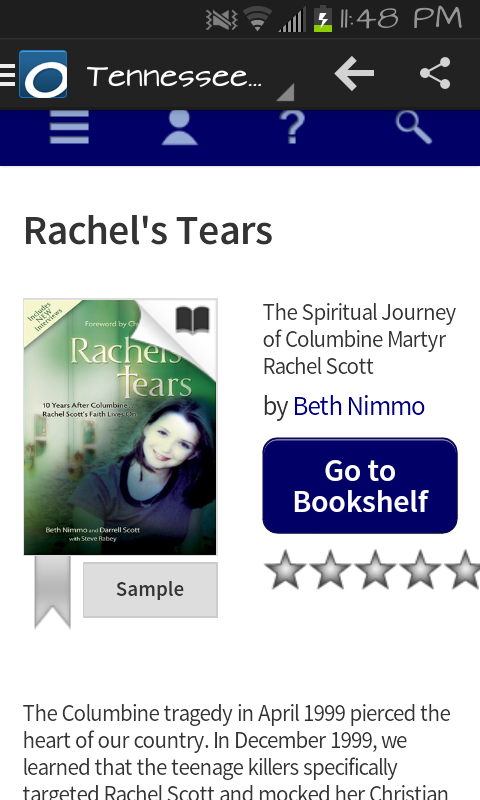 I recently finished ‘Rachel’s Tears’ by Beth Nimmo. 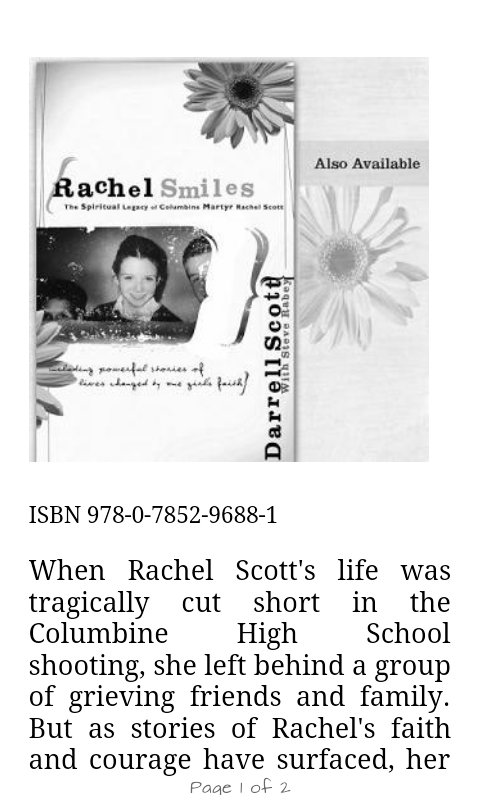 It is based on the journals, writings & drawings of Rachel Scott, a victim of the Columbine tragedy. I liked the book overall, however with most reads I did find myself with a few bones of contention. One thing I liked was the parent’s view & their heartbreaking recollections of that day. As a parent you are reluctant to indulge the terrifying question of “how would I react to that situation?” (Or at least I am…almost as though thinking about it may risk it actually coming true); they seem to have really opened up & portrayed their honest emotions, thoughts and actions. Your heart can’t help but ache for them. This type of book isn’t my usual cup of tea–it has a lot of religious references, quotes, etc….which is fine (to each his own & they were/are obviously religious people); I just don’t generally read material like that. 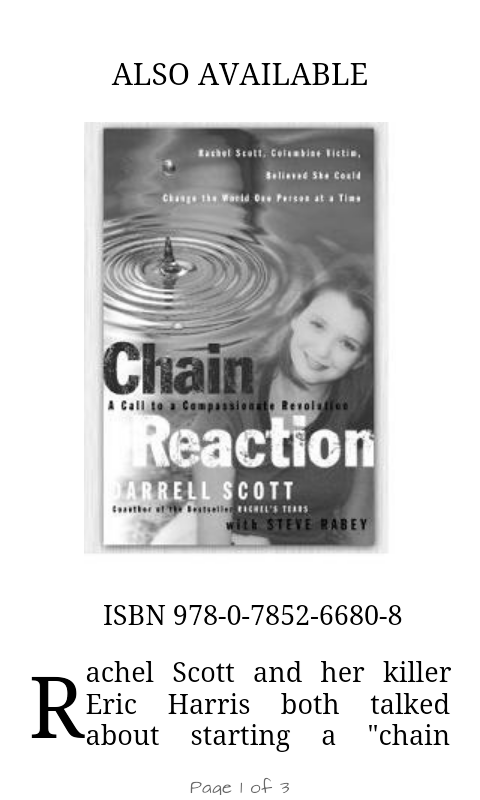 I wanted to read this because it had to do with Columbine & I figured it could offer some new views, which it did. It’s not a long read, so that’s good too. –It Seems like they didn’t have enough material/topic for a complete & thorough book…there is lots of repetition & what I can only describe as filler. –repeatedly saying “we hope you’ll see her spiritual side” when they reveal the fabled journal…yet keep stalling with filler & repeating other statements as opposed to revealing the journal. Granted there are pictures throughout the book of journal excerpts, but I had gotten the impression before reading that the journal was the book. Maybe that’s my mistake. Repeatedly promising that the reader will see the type of person Rachel was through her writings & journals & drawings, yet the reader sees only excerpts…it never quite makes it to the journals. Understandable in the sense that you don’t want to put your child out there, open their most intimate thoughts to the world…I get it. Just don’t promise to & then never deliver. –So at the end, I’ll admit, I was a little over the “God-speak”…props to them for spreading the good word, being 20x the Christian I am & trying to help people; it’s just not my cup o’ reading material. 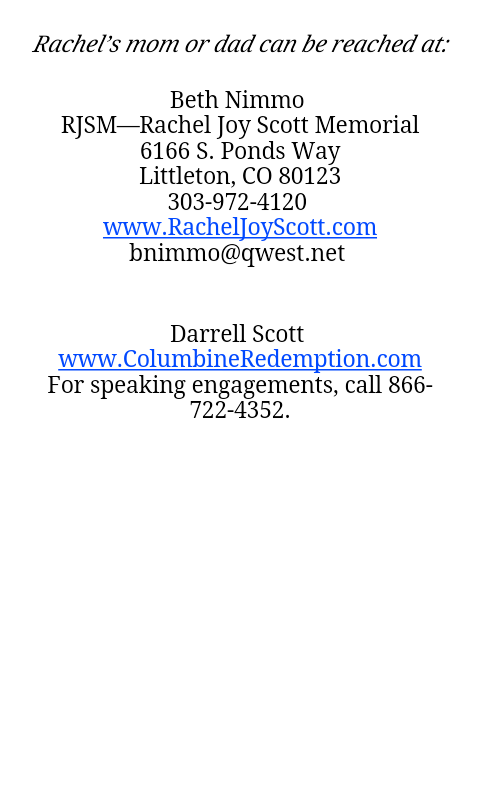 I wanted to do my part however & decided I would share the contact page they have in the back. I figured the couple people that read this blog may tell a friend or such. –My last complaint is, I feel, sort of a sensitive one. I can not imagine what these people & their family have gone through…I don’t want to imagine. But where does the money factor in? 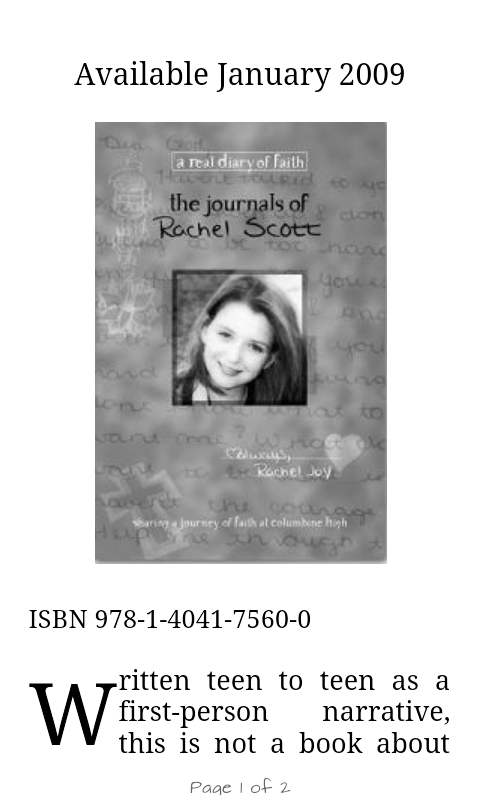 It’s one thing, say, if you have all these journals & drawings from your child who was murdered in a national tragedy; you want to share with the world all of the wonderful & positive qualities your child had (plus let’s face it: some of those precognition-esque entries/drawings are undeniably spooky & must be shared! ); you are proud of the person you helped create (as you should be); it gives you a final positive ending note to the atrocity that claimed your child. There are probably tons of other good reasons. So, one book…what’s the harm in that? The reality that a lot of people don’t confront is money. I, myself, have always wondered how people survive a crisis financially. Maybe I shouldn’t but I do (just like the people-ahem, me-that are obsessed with serial killers & the like wonder what a real dead body looks like) & it’s a real fact of life…money makes the world go round…if people have to miss work, chances are they’re not being paid (salaried persons don’t count in this instance. Obviously. )…if people aren’t being paid, how are groceries filling the cabinets? How does the light chase away the darkness? How does the car remain in the driveway? I think I’ve zeroed in on our culprit too. Now this is just my armchair detective theory, but the mom seems less involved in all the books after #1. Granted I haven’t read any of them; it’s just the sense I get. It’s almost as if by.book #2 dear ol’ Dad someone started planning future books & saving tidbits (entries, drawings, stories) to include in them. Again, I don’t begrudge anyone money…or the right to make it…it just reeks of exploiting this young lady’s private sanctuary under the guise of “helping people see the light”. I don’t know….maybe I’m being too harsh & judgmental, maybe I’m too negative. It just jumps out at me like that.